Chuck Norris dies at age 71! Not a Joke. 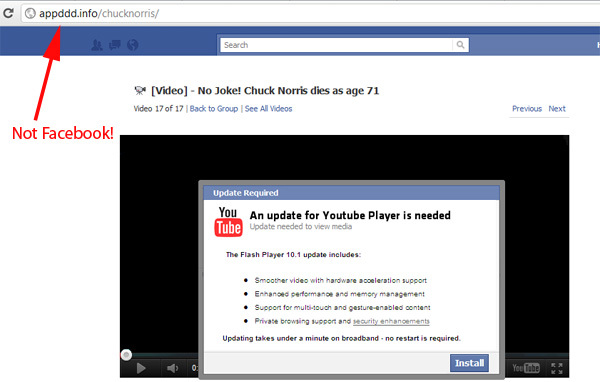 The scammers are hoping that users will think this is Facebook and that the Premium Youtube plugin is legit. The end game here is a rogue browser plugin. As with Facebook applications, only install plugins / browser extensions from trusted sources. Based on what we have seen so far, this one doesn’t fit the bill. Installing the plugin leaves your system totally vulnerable to the developer. Similar scams have been known to pack malware and viruses. Installing the plugin is definitely not worth the risk to your system. We decided to stop here and advise you to do the same.